Discovery Channel is headed back to the wilderness. Recently, the network announced the new season of Dual Survival will feature Naked and Afraid champions EJ Snyder and Jeff Zausch. 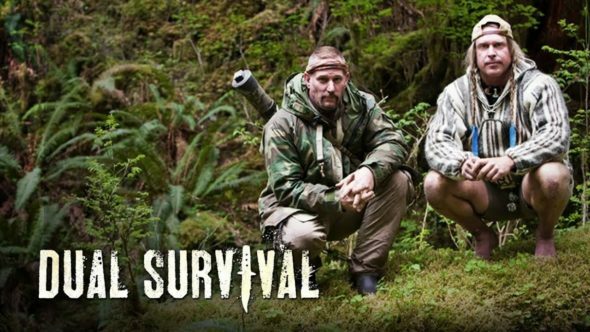 New episodes of Dual Survival premieres on August 24th at 9 p.m. ET/PT. Army combat veteran, EJ Snyder, and wilderness survivalist Jeff Zausch are no strangers to harsh environments – as fan favorites on Discovery’s NAKED AND AFRAID, the two have bared it all to survive in unforgiving conditions. Now the duo will take on the challenge of DUAL SURVIVAL, where they will brave exotic and merciless landscapes around the world. The new season is coming to Discovery Channel on August 24 at 9PM ET/PT. Survival superstars on Discovery’s NAKED AND AFRAID and NAKED AND AFRAID XL, Jeff and EJ have proven their expertise when it comes to outlasting tough, rugged scenarios. From fending off packs of hungry hyenas to building extreme rafts to battling serious infections, the Discovery Channel alums have seen it all – or so they thought. This season, EJ and Jeff experience tests like they’ve never encountered before – among the most intense are braving the alligator-infested coast swamps of Louisiana, navigating the pitch black caverns of the Caucasus Mountains in Georgia, and enduring the sun-scorched desert savanna of southern Brazil. Working together, they must overcome dehydration, hypothermia, and deadly predators to fight their way back to civilization. The dynamic duo complements one another’s unique skills and styles to tackle the difficult journey back to civilization. EJ – who carries the nickname “Skullcrusher” – is a decorated 25-year Army combat veteran and survival instructor. Jeff is a world-class hunter, experienced survivalist, and peak climber from the mountains of Idaho. With two varying approaches to survival, the tough journey often becomes rockier as their disagreements come to a head. Can they overcome their differences and utilize their combined arsenal of skills to survive? What do you think? Do you watch Dual Survival? Will you watch the new season? More about: Discovery Channel TV shows: canceled or renewed?, Dual Survival, Dual Survival: canceled or renewed? I don’t watch it anymore because I don’t like the two on it now.